This is a hand crafted pair of porcelain urns by Ina Williams. 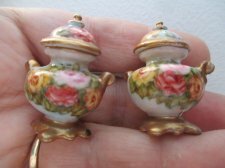 The pair are hand painted with flowers and gold trim. Just beautiful. The set is from an upscale collection. Enjoy.